Jeepers Creepers!! Welcome to the Pink by Design team Halloween Hop! If you have come here from Emily's blog then you are in the right place. If not and you would like to start at the begining please click here to go to Sarah's blog. I decided to bust out my older Pink by Design Halloween Stamps "A Haunting We Will Go". That is where the stamp "Jeepers Creepers" came from. Thanks for hopping along on the Pink by Design team Halloween Hop!! Did you know I'm on facebook? Make sure to click here to become a fan of my facebook page!! Oh, this is just so cute...and I love how simple it is! Super cute! Love the sentiment... Great Job. TFS. adorable i love the way you made this mummy so cute. thanks for sharing im a follower. I am now a follower here and on facebook. I love the mummy card--and how yu inked the edges to make it look old--so cute!!!! Now this is adorable! First mummy card I've seen. Thanks for sharing! Always love seeing your projects. Love this card! Oh my I absolutely love this card!! Such a cute idea!! Just adorable!!! Love the mummy! Thanks for sharing! I am a new follower and subscriber and Fan on Facebook! What an adorable card!! I love seeing all the creations you come up with! Thanks for sharing your ideas. lol! this is so stinkin cute.. i mean spooky ;) thanks for sharing and for the chance to win!! :) I'm a new follower. Jeepers Creepers - this is divine, Candace! TFS! Very clever! I love how you chalked the edges. Cute mummy card! This is something that I can have my 4 yr old help to make. Thanks for sharing! Oh, how clever. Love the eyes peaking out. LOVE this! That's just without a doubt the cutest little mummy I've ever seen! Great card Candace...I love it! What kewl looking card. I LOVE IT!!!! How clever and cute! Great idea! cute card! I made one kind of like that the other day and loved how it turned out! I really like this!!!! You did such great job! cute card. i love it. I am now following your blog and liked your fb page! Happy Halloween! This is so cute. Can't wait to try it! Oh, and thanks for the instructions! Great card. Love the idea! Wow I love it and it is so simple and Adorable!! TFS!! I am now a fan on your FB page!!! And I have been a follower on here for a while now!! Really cute card. Thanks for sharing your ideas! Very cool, thanks for explaining how you made it!! Super cute card! Just love it! TFS! am a new followers and facebook fan! OK! This is on my favorites to make following this this "Blog Hop", super job! Also left a quick note on your FB! WHat a fun, cute, card! Thanks for the hop! Your card is really cute, thanks for sharing it with us. I love the stamp behind the mummy it really makes the card pop. LOVE your card!! So creative and super cute! LOVE this Candace! So simple and cute!!! So cute mummy. Thanks for sharing. I am a new follower. Wickedly cool card! Love how you created the mummy. Great idea! Thanks for sharing. What a wonderful card. Love that mummy! It's really cute!!! I love how simple this is but yet looks like it is complicated! I'm a new follower! Super cute :) Sounds really easy I may have to try this. This is an adorable card. Love the "wrapping" and the sentiment. yep super duper cute !!!! ♥ it! Love this, so cute that you used a stamp back-shape, and the mummy with his shading is adorable. I love this cute card. Thanks for the inspiration. Very unique card, love it! Your creations are always amazing! I follow you on facebook too! How adorable!! I love the little mummy! I love it! THose eyes are great! Your card is so stinking cute. I love it... I might have to try my hand at one like it. Thanks for sharing. Candace, this is so creative! I love it:) The design of the lines is awesome. It looks amazing! You really ROCKED it. Your talent is endless!!!! TFS. Love the simplicity of this card! What a cute idea. I just love this card!!!!! 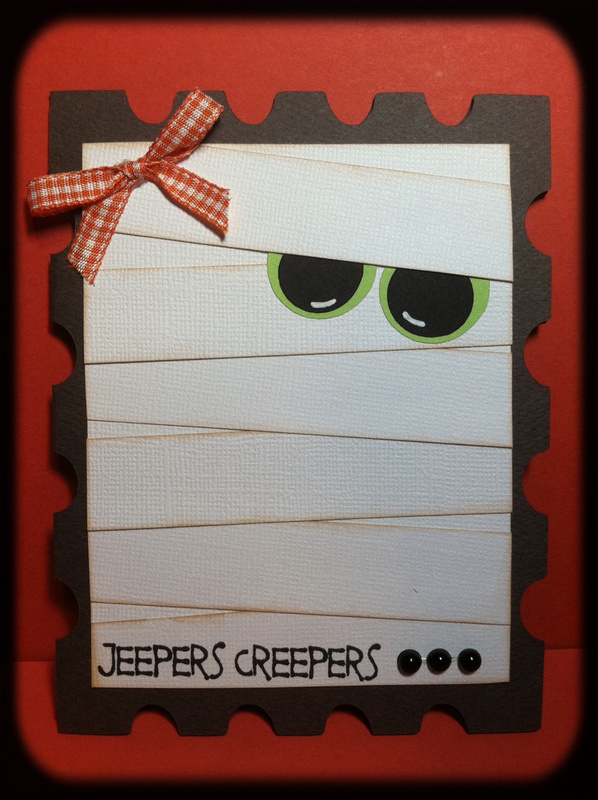 Adorable mummy card. Thank you for sharing. I love punch art, I will have to put this on my craft to do list. Cute card. Love the stamp. TFS. Absolute favorite project of the hop!! Not your typical mummy. Love it when somone thinks outside the box. Thanks. First Christmas Card of the year! !